If you are familiar with the German style of Grätzer (or Grodziskie, if you're Polish), you are probably wondering why the photo above shows a beer that is black. As usual, I didn't exactly brew a totally accurate historic style, but rather a close interpretation with a few of my own tweaks. Grätzer is brewed with smoked wheat in place of a base barley malt, which is, I would argue, the most significant characteristic of the style. It's also a low gravity beer that is meant to be light, effervescent and refreshing, despite the smokiness. Rather than pale golden, I made it black. Due to a few omissions in my knowledge of the style when I set out to brew this, my take wouldn't have been a 100% accurate Grätzer even if I hadn't decided to color this dark — Grätzer is supposed to be highly hopped, and I kept the hopping to a low 14 IBUs, and also misjudged the carbonation, likewise keeping it lower than it should be. 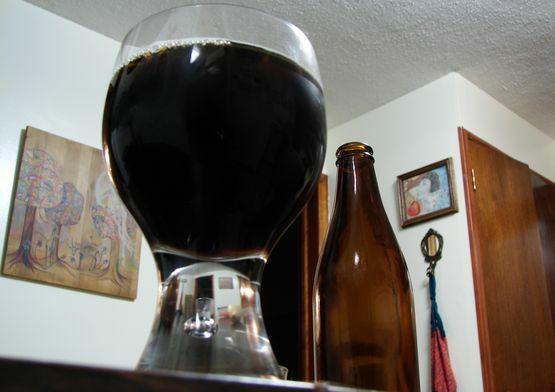 But back to the color: working under the premise that I would rather drink a dark smoked beer than a super pale smoked beer, I added a small amount of chocolate wheat and Carafa II — in the end, simply turning the beer black isn't really that huge of a change. Grätzer was long in danger of becoming an extinct style, and it remains one that is nearly impossible to find on any beer store shelf. If there are any commercial breweries in Europe still producing the style, they are super small and under the radar. (Professor Fritz Briem brews one with all sorts of stylistic issues). Up until recently, you couldn't even buy oak-smoked wheat in America, so if you wanted to brew a Grätzer, you had to smoke your own. And there's no substitute — the wheat malt is quite different from any other smoked malt out there. Fortunately, Weyermann just released its own oak-smoked wheat, meaning many more people can now re-discover Grätzer — so long as you're a homebrewer, or close friends with one. Had a hopped this more aggressively, or carbonated it to a higher volume, I imagine my Grätzer would have a bit more "zip." I can see how the style would benefit from a firm bitterness, and bubbly carbonation would make it quite refreshing. So yes, I do wish I had turned up the knob on both those settings. Nonetheless — and given that I am aware of its style deviations — this is a really nice beer. Really, quite drinkable. How could a smoked beer possibly be refreshing? Well, oak-smoked wheat is a very subtle smoked malt, for one, and wheat is inherently refreshing; the two double down, and create something that's creamy, light, and yet packed with a very unique flavor. It's hard to describe how well the smoked character is integrated, as it doesn't taste much like the "campfire and bacon" profile you get from most smoked beers. It's more like a spice character, or a dark salty chocolate character. It plays nice, not aggressively. This style demands balance, I think, and subtlety and low-ABV ensure that that balance is there, with a finish that's clean and crisp. Sure, wheat comes across as creamy and full-bodied, but despite my uncharacteristically conservative hopping regime, this isn't overly sweet. In retrospect, I probably dodged a bullet there. Wheat is a hard character to describe in beer — similar to rye, it often contributes more of a mouthfeel than a flavor, but you can definitely tell this is a wheat beer. Many people seem to mistake the unique character of hefeweizen yeast strains for "wheat," but wheat itself is more of a subtle, mildly-sweet bready flavor, and again, a deliverer of a soft, creamy mouthfeel. With the low carbonation, my Grätzer is nonetheless a little thin — yes, both thin and creamy at the same time. While adjusting the hop-bill and carbonation would be very easy tweaks to this recipe, the yeast selection is something I'm less sure about. I guess a neutral German ale yeast would probably be the most traditional choice, but anything neutral should do. As you can see in the recipe below, I just went with the English strain I had been using all winter, Wyeast West Yorkshire. Though it's not the most neutral strain out there, it somehow disappears into this batch; I can hardly pick out any of its usual fruity esters. Almost any American strain that you are fond of would do the trick, I think. I can say, also, that a hefeweizen yeast would probably not be a good choice — I'm not a fan of phenolic strains mixed with smoky malts, and I think it would upset the balance of this beer. Where did you get the smoked wheat? Or is it commonly available now? It's been months and months since I "got out of my cave" to look at what grains are out there. Haha, yeah, it's relatively easy to obtain now, since Weyermann started making it. I got it from Northern Brewer, but I think I've seen it at Brooklyn Homebrew too.